Most city homes and apartments are hooked up to sewers. In Chatham County, Orange County, Durham County and other rural areas many homes rely on septic systems. These out of sight `bacteria machines’ provide on site treatment of waste water. A septic system is a self-contained water-recycling system. Located underground somewhere on your property, a tank stores the waste from the house. Bacteria in the tank decompose this waste; the remaining sludge then settles in the tank and the effluent (the more liquid sewage) flows into the ground through a drain system eventually filtering down to groundwater sources. Tanks that are not working properly can pollute groundwater and surface water with unhealthy levels of dangerous bacteria.More than a one trillion gallons of waste flows through septic systems each year. It is easy to see how important to public health properly working systems are. When yours isn’t working correctly, it usually lets you know. The ‘bacteria machine’ AKA the septic system can be damaged by improper care. If the necessary bacteria in the system is destroyed, the septic system shuts down. Then, the sludge builds up and is pushed into the drainfield where it clogs up the system. Soon, you have a have a smelly sewage backup. The tank can be pumped out, but the drainfield cannot. 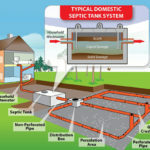 How can you avoid a septic system nightmare? stagger heavy water usage, i.e. showers, clothes washing, bathing. It’s important to have a map of the location of your tank so it is easy for your septic service person to locate. It also helps to mark the tank’s with a stake or stone. Your system should be pumped out and inspected every three to five years. A well maintained system should last 20 to 30 years.